Senator Corker introduced the EMSI in February 2015, and from the start, it has seen support from both sides of the aisle. It has also seen support from people across America. These people, the EMSI’s staunch supporters, are pastors and pilots, Westerners and Southerners, students and small business owners. They’re a diverse group of people who share a fervent desire to slavery ended within our life time. They are one very important reason why the EMSI has made it this far and is—hopefully—nearing the finish line. They’re people like Rusty Havens. I met Rusty on my first day working at IJM, which happened to be the first day of IJM’s Advocacy Summit here in Washington, DC. My starting assignment from my boss, Eileen Campbell, had been to find a reward for that year’s star advocate. Now that I know him, it’s no surprise at all that the recipient of that award was Rusty. The award fell far short of adequately representing Rusty’s contributions to the work of justice as an advocate. This actually says more about all Rusty has done than it does about the value of the reward; there aren’t many red carpets in the non-profit world, but if we had one, we’d roll it out for him every time. 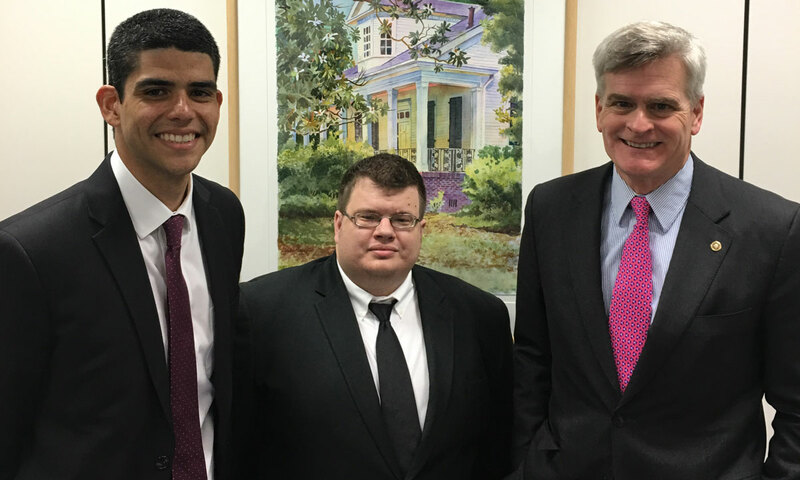 Since he found out about the problem of modern-day slavery, Rusty hasn’t stopped raising his voice and asking his members of Congress—like Senator Bill Cassidy (shown in the above image, along with IJM's Field Organizer for the Southeast, Rene Vazquez)—to use their power to help those who have very little. I asked Rusty to share a little bit of his experience as an advocate with us. I live in Lake Charles, Louisiana. How did you find out about modern-day slavery and human trafficking? At a college conference, seven years ago. At the conference, I was introduced to IJM. There I saw the amazing work IJM does. I heard that they were the largest anti-trafficking organization in the world. I became an advocate because IJM said it helps. What is the End Modern Slavery Initiative Act, and why is it important (briefly)? The End Modern Slavery Initiative Act addresses the global problem of slavery. It calls for a commitment from countries and private donors to help fund and replicate successful anti-slavery models, from organizations like IJM, on a larger scale. In what ways have you been impacted by your involvement with advocacy? I know it works. I have a new passion and love/hate relationship with politics. Advocacy works and I can have a real impact in the fight against slavery by advocating. In what ways have you been impacted by your work with IJM to fight modern-day slavery and human trafficking? After getting involved with IJM, I came home and asked if trafficking happens in my city. I found out the answer was a resounding yes. I started talking about human trafficking to anyone who would listen. Invites started coming my way to speak from all sorts of audiences. I've spoken before churches, schools, law students, motel owners, socials workers and many more people from all backgrounds. Now, I have my own organization that helps fight trafficking locally and plug people into the work of IJM. What’s your message for everyone out there who is reading this? I ask readers to get involved. I don't care who you are, you can make a difference. I believe the only thing that prevents trafficking from ending is our apathy and indifference. We can end it, so I say why not! I believe the only thing that prevents trafficking from ending is our apathy and indifference.